Peacefully passed away with his family by his side, 27.3.2019, aged 83. Loving Dad to John, Ken and Samantha. Proud Grandfather to Chelsea, Lewis, Sophie and Harrison. Former husband to Mavis. Set Sail on his Final Journey. 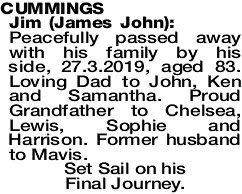 The Funeral Service for Mr Jim (James John) Cummings of Fremantle, will take place in our Chapel, 312 South Street Hilton commencing at 10.00am WEDNESDAY (10.04.2019). 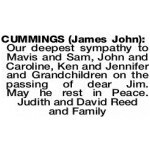 James John JIM We will miss our Poppa Jimmy and our regular Saturday cups of tea. We are so happy that our kids got to know their grandfather and create special memories. 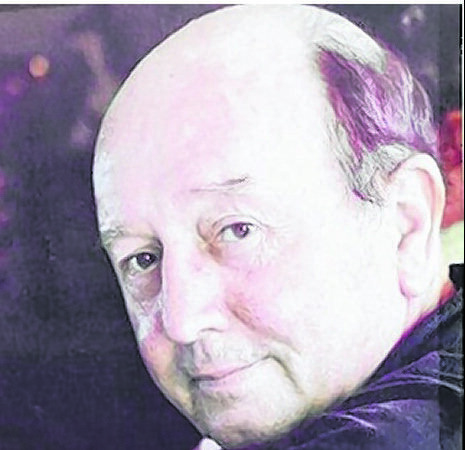 Jim has now set sail on the greatest journey of them all and our hearts are with him. All our love from Ken, Jen, Sophie and Harrison. 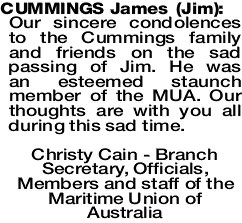 Our sincere condolences to the Cummings family and friends on the sad passing of Jim. 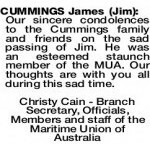 He was an esteemed staunch member of the MUA. Our thoughts are with you all during this sad time. 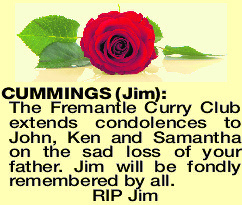 CUMMINGS JIM The Fremantle Curry Club extends condolences to John, Ken and Samantha on the sad loss of your father. 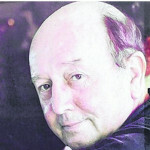 Jim will be fondly remembered by all.